Q. What is the function of the corrugations on the insulator? A. They are what we call current creep barriers and prevent flash-over. 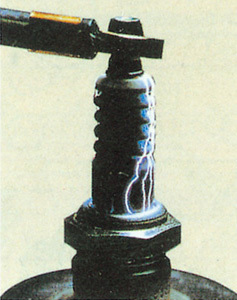 Flash-over is when there is a voltage discharge between the top terminal nut and the metal shell of the plug (as shown in the picture, left) and is highly undesirable because it weakens or prevents the spark occurring within the combustion chamber. This will lead to misfiring and poor performance and to prevent this phenomenon taking place corrugations (ribs) are provided on the insulator which in effect extend the surface distance between the terminal and the metal shell. This design enhances the insulation needed for preventing flash-over. Note: Always ensure that the spark plug insulator and the covers/caps are clean and in good condition as worn, perished or dirty covers/caps significantly increase the chances of flash-over occurring. Q. 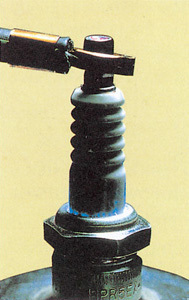 Is a stain between the insulator and metal shell caused by gas leakage? A. On occasions, when a spark plug is removed, a brownish stain that looks like a sign of combustion gas flow can be seen on the insulator just above the caulked portion ofthe metal shell. 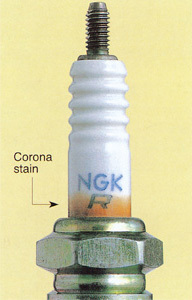 This discolouration, known as Corona stain, is the result of oil particles suspended in the air adjacent to the plug becoming attached to the surface of the insulator. It does not affect spark plug performance. Q. Why does Corona stain occur? A. Spark plugs have very high voltages applied to them in order to create a spark at the electrode gap. 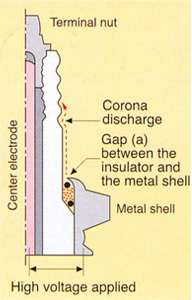 Under certain conditions this high voltage creates a phenomenon called Corona discharge (pictured, left) which occurs over the insulator just above the metal shell. It is formed due to the ionization of the gases around the plug. The oil particles are attracted by this discharge and adhere to the insulator causing the discolouration. In low light conditions this event may be observed as a pale blue glow around the high tension leads and plugs. What is a judder damper?